Posted on Wed, Jan 11, 2012 : 11:26 a.m.
University of Michigan officials are continuing to investigate the cause of a water main break that has temporarily closed the U-M Comprehensive Cancer Center after flooding some areas of the center, University Hospital and the Medical School on Tuesday afternoon. Three of the four patient care floors at the Cancer Center were affected by the break, which occurred in the mechanical hub of a Medical School building at 1:30 p.m Tuesday. 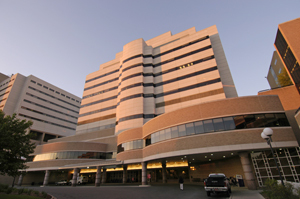 The U-M Health System has closed the Cancer Center to patients completely, moving patients to the new C.S. Mott Children's Hospital and Von Voigtlander Women's Hospital and rescheduling most non-emergency procedures. The upper level of the center, which houses research laboratories and offices, remains open. The lower floor of the west wing of University Hospital was also affected by the break. That area houses support staff, who have been temporarily moved to another location. The mechanical room of the medical school was also affected. Kara Gavin, UMHS director of public relations, said the Cancer Center building sustained minimal damage during the break and that UMHS officials spent the morning assessing how best to clean and sterilize the hospital in the wake of the burst pipe. "They're looking at what needs to be done to clean up and assessing the mechanical areas," Gavin said Wednesday morning. She said the cause of the break has not been determined and is still being investigated. AnnArbor.com will provide updates when additional information becomes available. Wed, Jan 11, 2012 : 11 p.m. I presume the water break didn't come from the cold weather we're having? (just teasing, note sarcasm about the warm weather) Although this was just water... I'd like to give some sincere thanks and appreciation on this update to both the Ann Arbor news and Kara. I really like this sort of communication and notification to the public. Although this break/flood/spill/event was just water and not something else, it's really nice to see the improvement in communication. It's a marked improvement over how a nearby, prior, unsolved event was handled/communicated. Officials were unable to solve this event near 1700 E. Medical Center (address listed on the AAFD report): <a href="http://a2docs.org/assets/files/2011/04/05/AAFD_incident_report_on_spill.pdf" rel='nofollow'>http://a2docs.org/assets/files/2011/04/05/AAFD_incident_report_on_spill.pdf</a> May your cleanup effort go well and thanks for the improvement in communication. I feel much better, as I believe that mistakes/lessons from the past are helping with communication on future events (such as this water break). This water break is a good lesson as to how things should be done -- and my kudos to Kara, the Ann Arbor news, and to those working on the cleanup. Wed, Jan 11, 2012 : 10:37 p.m. I hate to point out the obvious, but haven't we already identified it as a water main brake? Thu, Jan 12, 2012 : 2:22 a.m. The pipe broke, they tend to do that from time to time. Wed, Jan 11, 2012 : 11:01 p.m.
just a guess, but i guess that they'd want to know why it broke. it wasn't cold outside, so what caused it?